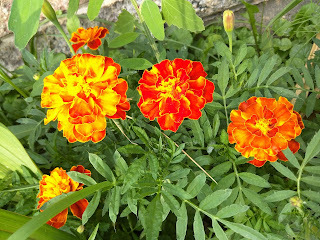 Due to the heat and extreme amount of sun we have been getting recently and the fact that I really have not taken the plants into the house for quite some time, along with the unfortunate water logging incident, most of my plants have died. All that is left are the 2 that actually like the sun and heat! The tomatoes and cucumbers! They are doing very nicely albeit in pots too small for them... I will soon transplant them into larger containers and they should do great! 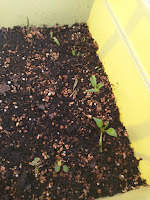 I started some more seeds that I know will take a long time to germinate. I am curious to see if they will or not. To do this I cut up some water bottles and filed with some potting mix that I made. Added a little water and a few seeds to each. I only did one of each and will thin down once they begin to grow out since I dont want a huge crop. I have made that mistake before. Growing way more than needed and the plants not typically doing as well as they can because of it. That in addition to not having enough space for everything. 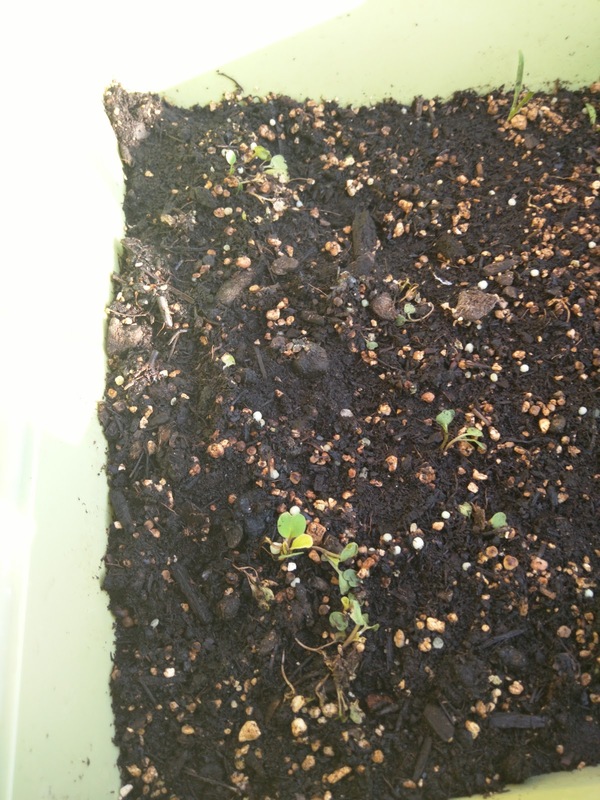 In addition to the slow germinating plants, I also restarted my basil and arugula. These are 2 things that I really don't want to live without. I also made a huge order of seeds!! I got some of everything so that I can have a variety of things to plant and grow throughout the year. I am pretty excited about it since they are all heirlooms and many of them are very unique varieties. I gravitated towards anything purple!! Aside from the seeds and the seed starting... I also ordered and received... WORMS!!! Yes I went and bought worms... Why, you ask? I bought worms because I am going to use them to create compost to be used in the garden to keep the plants healthy and happy! Basically you simply put the worms in a bin with cardboard, paper, and leftovers(no meat, dairy, or lemons) and the worms break everything down and their leftovers just happen to be the best type of compost available. Also, composting with worms is much faster then a regular compost pile. I only bought 250 worms this time and am now thinking I will definitely need more with the amount of food these kids waste. For now I drilled a ton of holes in the top of a small bin and cut holes into an aluminum baking dish which will sit inside of the bin. I them lined it with some paper and added some water along with the worms, just to revive them and let them settle after being shipped. 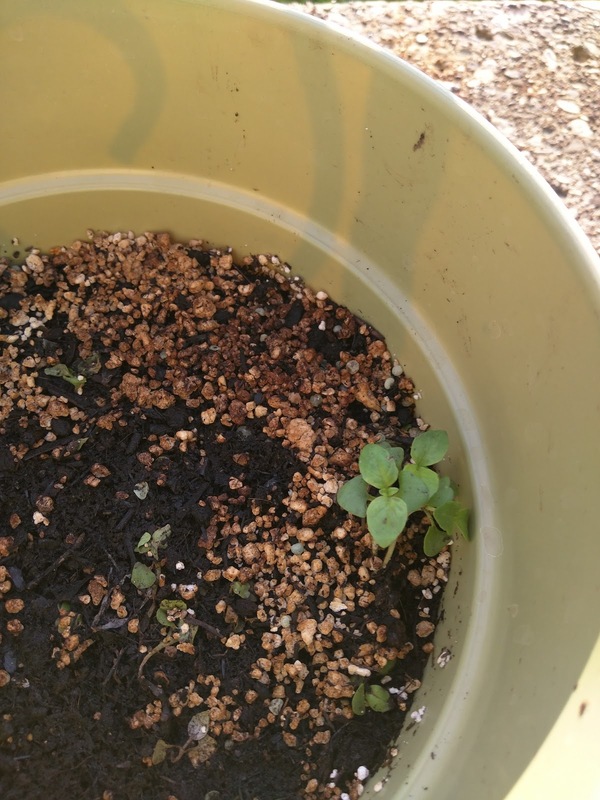 I blended some romaine lettuce that ended up going bad and added that to the bin as well for the worms to eat. 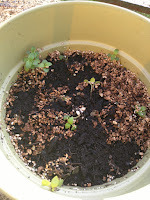 Re-potting the Seedlings & the Flowers!! 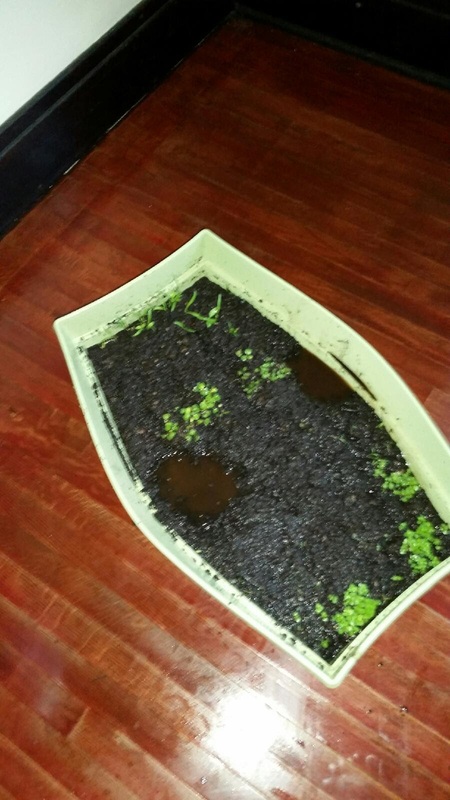 So in the last gardening post I stated how the planter that I was using had flooded out. It was definitely time to replant everything. I went ahead and did the seedlings of the plants that had already presented themselves in that particular pot. 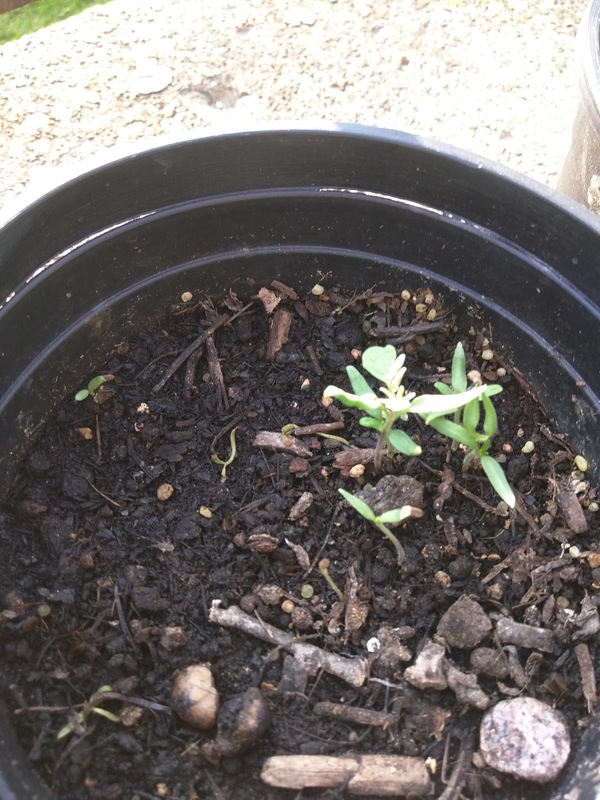 As I was poking around in the bin and found what I am hoping are Sage roots ready and waiting to sprout! Time will tell with that though. I will probably replant seeds for those that didn't and probably will not come up due to being drowned out. I put them all into pots and separated them for the most part so that they would grow a little better and not be so crowded out. I don't want too many of them to die... Restarting my garden has proven to be a little difficult. There are just so many things that I need to learn and relearn! I put the majority of the Summer long Basil in one pot and the rest of that along with the Lime Basil in another. The Cilantro got its own pot. 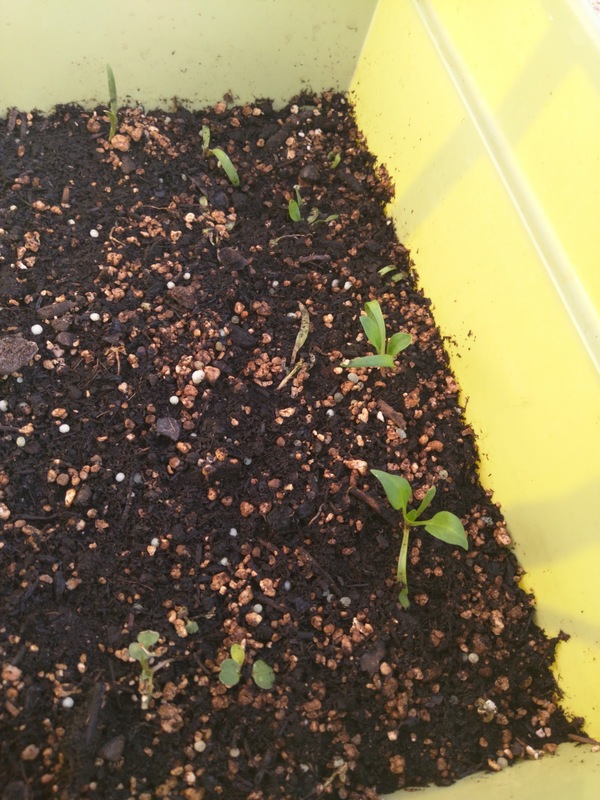 The Spinach and Arugula I put in the same pot spaced about an inch or two apart in rows. Its been a few days since I re-potted and the spinach seems to be doing OK so far and some of the arugula and basil are slowly died off. The babies did help with the re-potting. I mixed up some new soil. 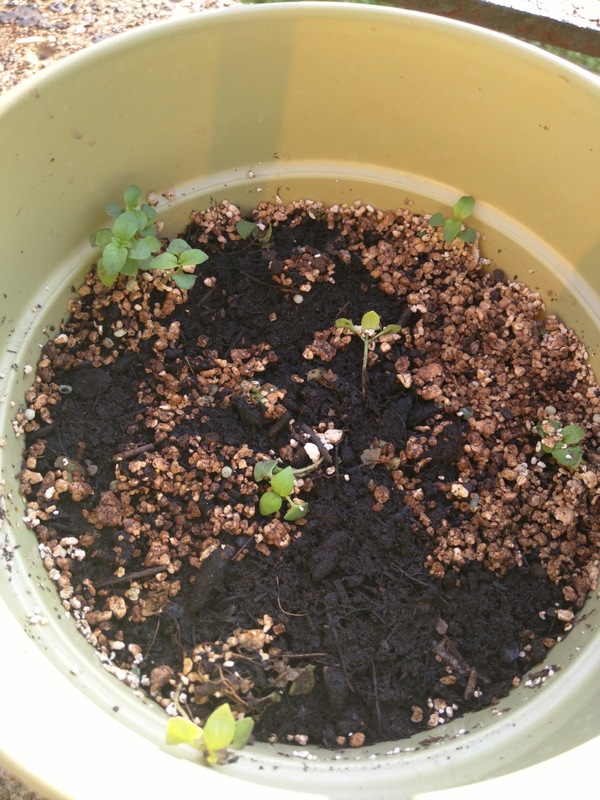 I used perlite and organic potting soil in my mix this time and we definitely got our hands dirty. 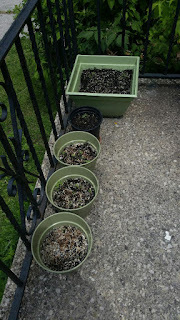 I forgot to add in the fertilizer this time but they plants will all be transplanted again pretty soon.. I did sprinkle some on the top and dissolved some to water them with. The cucumbers are growing great!! I do think I will need to re-pot and separate them soon. I am seeing a tiny bit of powdery mildew growing on the tips of the leaves. When I set the pots outside The leaves of these in particular get chewed on like crazy! Me no likey this..
My tomatoes are coming up pretty good!! Slowly but surely. I have I believe about 5 Tomato plants here. I am going to have to trellis them both and am very interested to see how much they both grow and how much they each will produce. So far so good!! Lets see how well they all grow up!! The rest of my flowers are so pretty!! I planted a lot more but many of them have yet to bloom along with my iris' dying... :( But I am pretty happy with the flowers that have presented themselves. 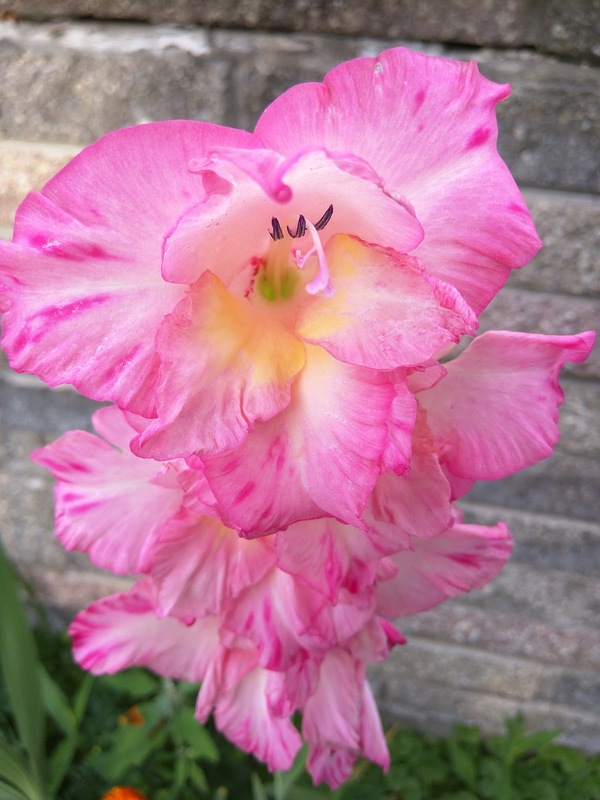 The gladiolas were supposed to be purple... But they turned out this lovely pink!! So pretty!! My gladiolas are however dying flower by flower from the bottom up... Ughhh!!! I am going to attribute this to the soil in my front yard. I did not properly fertilize it and just kinda stuck them all into the ground... It could also be due to all the weeds I have as well and they are all competing for space and nutrients. Live and learn. Next year I will add a goo layer of mulch and make sure I weed the garden and surrounding areas diligently. There are so many weeds!!! 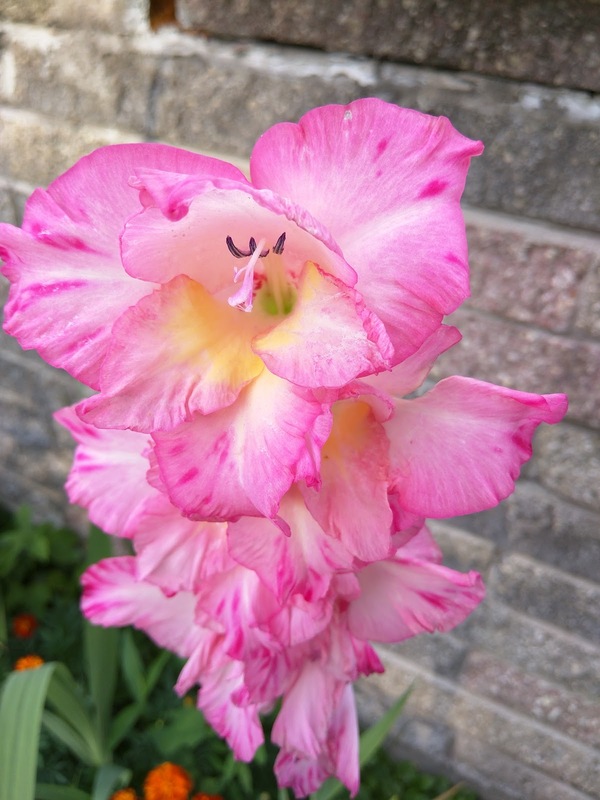 The photo on the bottom right I am not quite sure which flower this is since I planted so many.. But I believe it is my Cosmos! 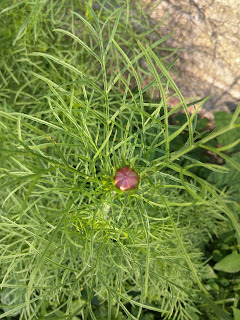 There is a bud forming and I am just waiting in anguish for it to bloom!!! 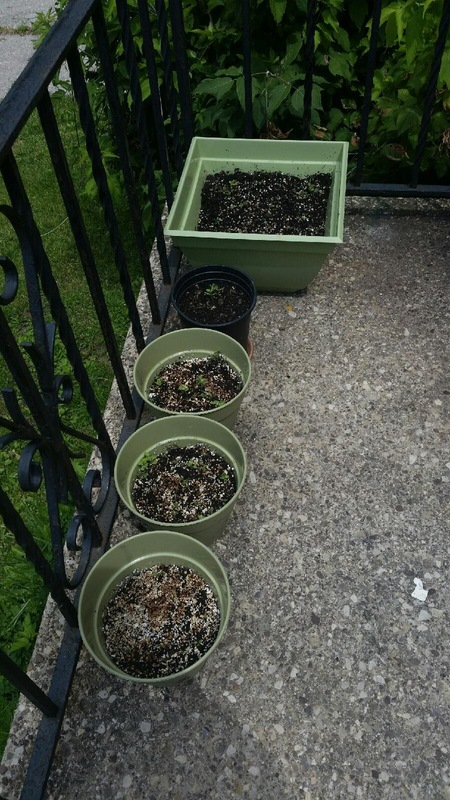 Starting an Herb/Vegetable Garden with Kids! I started another Herb garden! I absolutely love fresh herbs and veggies. However, herbs in particular I have a really hard time keeping them on hand since I use them so much. I really don't have time to run to the grocery store every few days just for some cilantro & basil, which I use very often. I loved my little garden that I had before and through a lot of trial and error I am starting back up again, with the help of the babies. I am always a little too ambitious with my garden and things of the like. I want to grow EVERYTHING!! 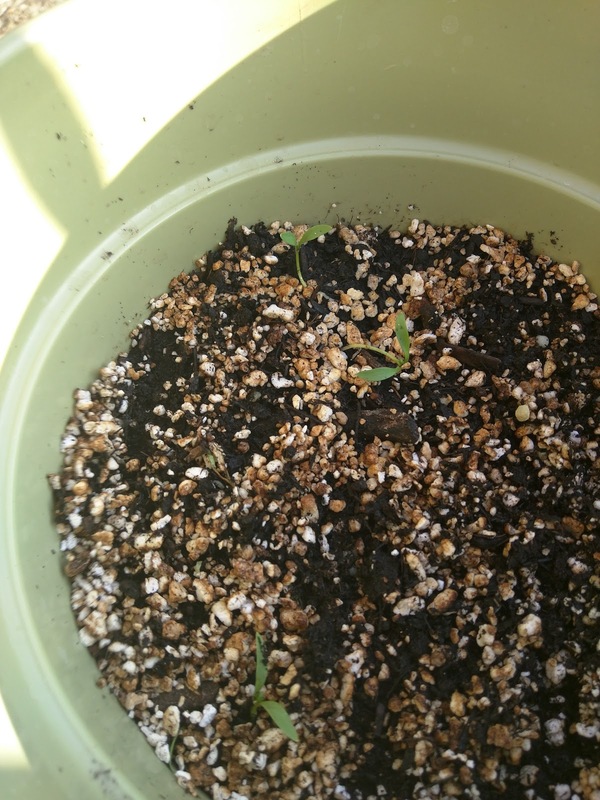 I started some seedlings and right now I have, 2 types of Basil, Cilantro, Sage, Chives, Arugula, Spinach, Green Onions, Tomatoes, and Cucumbers. I put them all, aside from the Cucumber and Tomatoes, in one huge rectangular pot along with some organic vegetable potting soil. 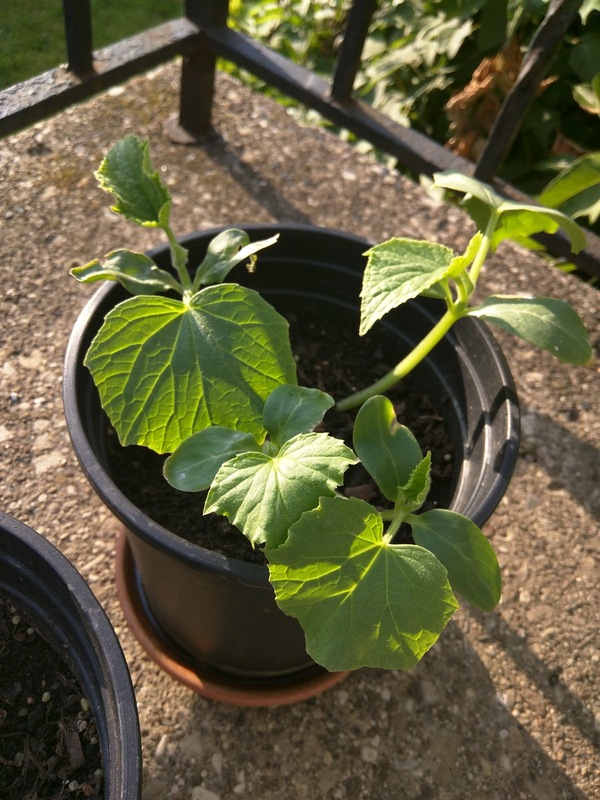 After most of the seeds germinated I have been letting it sit out on the front porch to get the sun it needs. However, since it has been raining, the big pot got soaked!! It reminded me how I have no drainage system going on in that particular pot!! I got this pot from Home Depot since that and Walmart are where I get all of my gardening things. As you can see the planter is bowed out A LOT! And even though it has been a few days it is still over saturated with water. Because of this, what I am going to do is remove everything once they start to get their true leaves. 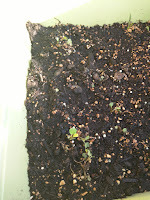 I am going to replant the entire box! Probably go and get a few more since I planted so much Basil and Arugula, I don't want them to die out due to overcrowding. I am going to place large rocks in the bottom of each and then cover with some type of screening so that there can be a decent gap. Place some wick so that the liquid in the bottom does not go to waste and the box doesn't have to be watered as often. Then finally I will add the soil back and replant what I want in each box. For the tomatoes and cucumbers I may have to get bigger pots and I will also need a cage of some sort to keep them growing up instead or out. 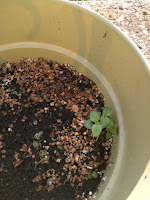 The babies have been helping me along the way with the gardening and doing very well. 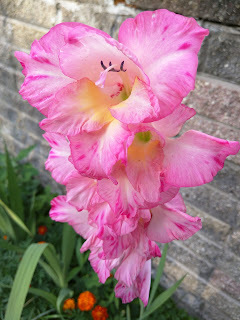 I also planted a TON of flowers in my front yard and they are growing like crazy!! I started with some gladiolas and blue iris, then added some marigolds and a mixed flower of various kinds. Finally I planted some cosmos, daffodils, and tulips, because I love them, although very late in the season. Everything is growing very nicely! Especially the gladiolas and the marigolds, which took forever to start growing!! My blue iris grew nicely until it was time to bloom and them the flowers died!! Just the flowers... So I pinched them off but the stalks were not looking very nice, so I cut them down. Now that I am reading up on them, I should have left them until they died themselves. I am hoping that the stalks and flowers will grow back before the season is completely over. The daffodils and tulips have not popped up just yet. 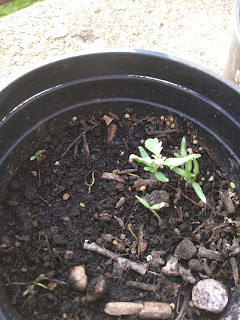 I do see foliage that looks like its coming from the daffodils however and I am excited to see if they will flower since they are an spring, early summer plant. I will be collecting seed from each and every flower for next year and I cant wait to see how they will all look next year!! Points System - Doing better! In said chat we went over all the rules and expectations of each other. We talked about being disrespectful and treating others the way you want to be treated. This rule in particular is something that my grandmother instilled in me and to this day is something that I live by. I reiterated the Golden Rule to them several times and will probably do so again everyday until they actually get it. I quickly wrote down and assigned a few chores to each of them to give them something to do while I am at work today. So far so good. Also since they lost so many points the other day I gave them a bonus. As long as they do all their chores and respect each other for the rest of the week they can have all the points that they lost back. That made them a little excited. They are getting there.... Thing is they have not cashed in any of their points just yet so I am concerned that they do not and will not value this system without reaping the benefits of it yet. Points System Crash & Burn!! So as usual I left for work giving the children a few odd jobs to do for the day, since there wasn't much to do aside from the kitchen. I came home from work to the house the same way that I left it!! They did not do a single thing!! I was so upset! I ended up just going upstairs and laying down reading up on clean eating and gardening, because that is my current thing. My daughter wanted to make apple pie and since I promised her we would make it days ago and bought all the ingredients I said "OK, fine." I then went to sleep while she baked with the help of her brother and my sister. When I woke up this morning I came downstairs to cereal all over the floor, the kitchen looking worse than the previous day and just crap everywhere!! I decided I wasn't going to make them do anything while I was at work since they have decided that they don't have to listen to a text or video chat... When I get home tonight they will each be assigned a job one at a time until the whole house is spotless!! While I am at work however, they are grounded and not allowed to come out of their rooms aside for eating. No TV, cell phone, nothing. Just books to read. 2 Weeks with the New Points System - Motivation!! They are actually doing very well!! Including my young one! The point system is giving them the motivation to get things done without me having to tell them to do it! One thing that I noticed is that they are having a hard time completing something TOGETHER. They always end in some kind of fight or someone just stops working altogether. This is something that I am going to have to work on with them, as I want them to be able to do things without always fighting. I used word & publisher since I have it at work. If I were at home(& my macbook pro hadn't died for the umpteenth time) I would be using Pages. This is just the basics of what I put together. I also created the lists with their Daily Tasks for each and put Avengers characters in the backgrounds to give them a little more excitement and sense of ownership. I laminated each of their Daily Task sheets and had them tape it to their walls in their bedrooms. The first page on this is a list of chores that I write down as I come by them. Sometimes I assign them sometimes I don't. The second page is theirs. I printed out multiple copies of this and on it they can mark down all the things that they did everyday. I work a full time job in addition to taking care of 3 children on my own. My babies are highly intelligent and highly active. My youngest is super Hyperactive. Such a sweety pie, but he is constantly getting into things he shouldn't be. When they first got out of school, they lacked the structure that they are used to and need in order to keep themselves on task. They have been running rampant like a pack of wild dogs!!! Kids in general need structure, so I have put together a daily task list and a point system for them while I am at work. This way I do not have to come home to a mess everyday and blow a blood vessel trying to get them to do the things that they are supposed to do. I set up a schedule with a list of daily tasks and chores for them to do. There is space to add additional chores if need be depending on what is going on. There is also a space to keep track of the points that they accumulate throughout the week. At the end of each week they can choose to use their points towards something that they want or want to do, or they can save their points to let them accrue towards whatever goal they may have. This will be an absolutely interesting experiment and journey. I am very interested in seeing how far my kids will go to get the things that they want. It has been a few days and the older 2 have taken to it pretty well. My youngest is still trying to figure things out. He hasnt been able to understand the concept of working towards something just yet.